In the following exercise, we demonstrate how different migration and fertility-influencing policies can lead to large differences in future annual greenhouse gas emissions, and in cumulative emissions throughout the century in the European Union. We present nine scenarios representing migration and fertility policies leading to stable, declining, or growing populations. The scenarios leading to decreasing populations have great potential to reduce total greenhouse emissions in the future, and to meet ambitious climate goals. On the contrary, scenarios leading to continuous population growth make it much harder to meet climate goals, requiring substantially larger reductions in per capita emissions and potentially leading to much greater total greenhouse emissions in the future. Without exception, European countries have successfully made the demographic transition, resulting in sustained below replacement fertility rates: an average of 1.6 children per woman in total fertility rate in 2016. These low birthrates are naturally leading to aging societies and eventually, declining populations. Fearing the detrimental social and economic effects of population aging, stabilization and decline, the EU and national governments are scrambling to institute policies that soften this decline. These policies often aim to boost the size of the workforce by raising national fertility rates and/or securing high net migration levels. Everywhere in Europe, aging, stable, or shrinking populations are viewed as negative and avoidable by governments, while continued population growth is judged desirable1. According to recent population projections made by The Overpopulation Project, different policy changes influencing fertility rates or net migration levels could make a big difference in EU population numbers going forward. The following population projections capture a wide range of policy options, encompassing 5 different scenarios for both migration and fertility developments in the EU through the end of the 21st century (figures 1-2). Figure 1. The status quo economic and social policies scenario assumes an increase of 0.1 child/woman in total fertility rate compared to the current level. All the fertility scenarios assume the continuation of the 20 years average annual net migration level (1,188,235 people). Figure 2. Status quo migration is the continuation of the past 20 years average annual net migration level (1,188,235); half, 2X and 4X status quo assume halving/doubling/quadrupling of the 20 years average net annual migration level by 2026 and then continue this level until the end of the century; the zero net migration scenario assumes the same amount of immigrants and emigrants annually from 2026. All the migration scenarios use “status quo total fertility rate”, i.e. 1.7 children/woman. Beside targets to boost national fertility, the EU and its member states have ambitious climate goals. The EU has enacted legislation to reduce greenhouse gas emissions by 2020 by 20% compared to 1990 levels; have a 40% reduction target in the nationally determined contribution (NDC) by 2030; and has a low-carbon economy roadmap aiming for 80-95% reductions by 2050 (figure 3.). Can these population and climate goals exist side by side, or do they work at cross purposes? Population size and growth generally lead to increased CO2 emissions. Despite considerable differences in per capita consumption, more humans emit more CO2 (all else equal)2,3. A recent study by Weber and Sciubba (2018) found a considerable contribution of regional population growth to CO2 emissions in Western Europe. Between 2000 and 2008, one additional percent unit of annual population growth was associated with additional 2.5 kilotonnes of CO2 emissions2. Of course, it is unrealistic to assume that population will change independently of other influencing factors, and many argue that future changes in technology or income may compensate for the near scale effects of larger populations. Nevertheless, we expect that our policy scenarios leading to continued population growth will make it harder for the European Union to achieve its ambitious climate goals, even with considerable per capita emission reductions. On the other hand, scenarios that yield smaller future populations have great potential to keep more greenhouse gases from being emitted into the atmosphere, especially in combination with per capita emission reductions. In the following basic exercise, we demonstrate the potential impact of total population size on greenhouse gas emissions throughout the century. We use three per capita reduction scenarios with nine population change scenarios (figures 1-2) and compare the resulting absolute emissions to the reference scenario, and to the minimum and maximum EU emission goals for 2050 (see figure 3.). The aim of this simple exercise is not to predict or forecast future greenhouse gas emissions, but to illustrate with alternative assumptions what might happen if Europe’s population grew more or less rapidly, or declined. In the EU reference scenario, total GHG emissions are projected to fall 48% by 2050 relative to 1990, and per capita emissions are set to decline to an average of 5.66 tonnes of CO2e (CO2 equivalent)4. In context, this means that by 2050, an average EU citizen will emit approximately the same amount of GHGs as an average Swede in 2016. This emission projection is based on the optimistic assumption that the legally binding GHG and Renewable Energy source targets for 2020 will be achieved and that the policies agreed to by the EU and its member states will be implemented. According to the EU reference scenario for 2016, the goals suggested by the “low carbon economy roadmap” are not going to be met (80-95% reduction by 2050). Combining this per capita emission decrease with all possible 2050 population sizes from our fertility and migration policy-based population projections (figures 1-2), we see that the reference scenario emission level is exceeded in the three highest population scenarios (red line on figure 4.). Under only a 1.5 times reduction in per capita emissions (from the current 8.7 to 5.6 tonnes of CO2e) no scenarios can meet the 2050 goals of the low-carbon economy roadmap, represented here by pink and green lines. A 3.5 times reduction is needed to meet the “minimum” 2050 goal under the lowest population (zero net migration) scenario; in contrast, a 5 times reduction is needed under the highest population scenario (4X status quo migration). The same relationship holds for meeting the “maximum” 2050 goal: this demands a 14 times reduction under the lowest population scenario versus a 20 times reduction under the highest. Let’s look farther into the future, and assume that per capita GHG emissions will halve by the end of this century, to 4.35 tonnes of CO2e in 2100. In this case, we see that the steep population growth of the highest population projection (4X status quo migration) would completely offset the effect of the per capita consumption reduction, even leading to an increase of annual GHG emissions until 2050 (figure 5.). In contrast, the fastest declining scenario (zero net migration) leads to substantially reduced annual GHG emissions, to 1.38 GtCO2e (gigatonnes CO2e). For comparison, the EU emitted 4.44 GtCO2e in 2016. 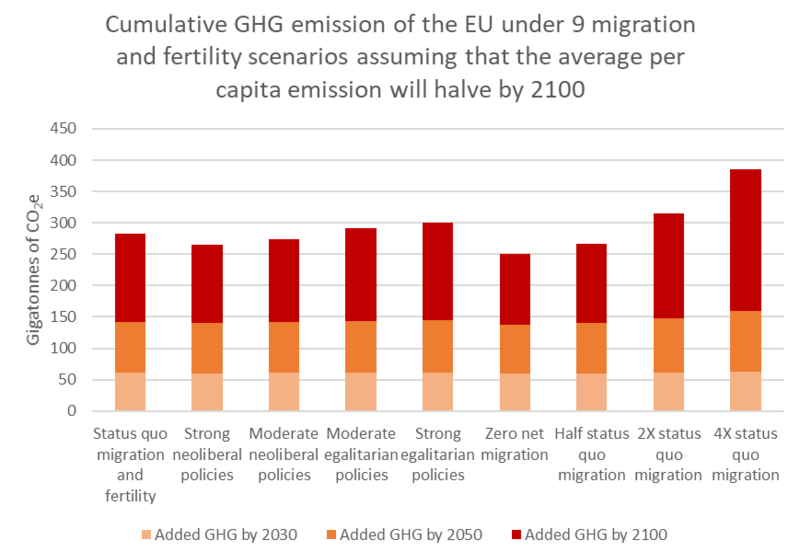 All the fertility scenarios would lie between the double status quo net migration and the zero net migration scenarios, and none of the population projections are consistent with the low carbon roadmap’s reduction targets. Figure 5. Total annual greenhouse gases emitted under five migration scenarios, assuming a linear decrease in per capita GHG emission reaching 50% of today’s per capita emissions by 2100. Summing up the annual emissions of the fastest growing and fastest declining scenarios, thus calculating the cumulative GHG emissions, moving from the fastest growing to the fastest declining scenario in the EU would save us 132.8 GtCO2e by the end of the century; this is equivalent to total global GHG emissions between 2002 and 2004. Even if we reject the two extreme migration scenarios as unlikely and compare the double and halved net migration scenarios, there would still be 47.5 GtCO2e saved by 2100 if we choose the scenario resulting in population decline. Let’s examine a more optimistic scenario and assume that per capita greenhouse gas emissions in the EU will fall even further in the future, from the current 8.7 tonnes of CO2e linearly to 2.2 by 2100. This possible future could be due to widespread use of renewable energy, improved efficiency, or other technological and societal factors. This low per capita emission level is equivalent to average annual per capita emissions in the United Kingdom in 1800, early in the industrial revolution. 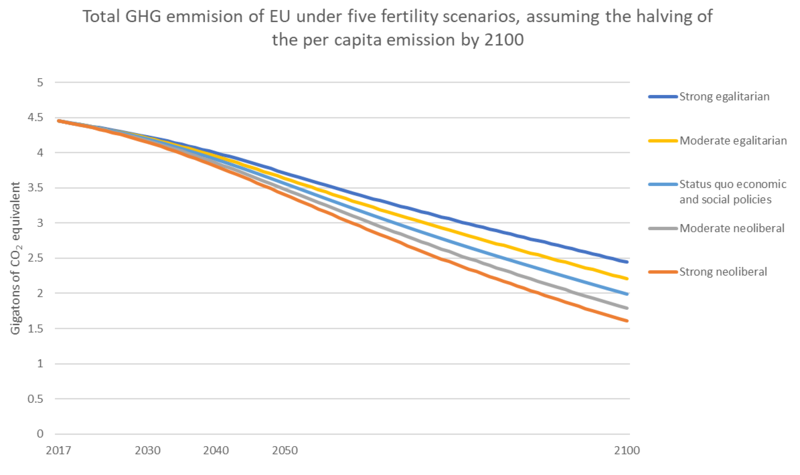 Even under such an optimistic assumption, four of the migration and fertility scenarios leading to higher population numbers would be unable to meet the low carbon 80% emission reduction goal by 2050 (Figure 6.) The five scenarios that result in stable or declining EU populations, in contrast, are consistent with this goal (status quo fertility and migration scenario, half and zero net migration scenarios, and the two neoliberal fertility policies scenarios). Examining cumulative GHG emissions throughout the century, the scenario with the lowest projected population would result in 207.1 GtCO2e by 2100 (figure 7). Compared to the 304 GtCO2 emitted under the highest population scenario, following a humbler demographic path would reduce cumulative emissions by 97 GtCO2e by the end of the century. If we compare the more likely scenarios with double and half status quo migration levels, the difference still would be quite substantial: 34.7 GtCO2e (figure 7), which is approximately equal to all global CO2 emissions in 2011. Figure 7. Difference between cumulative greenhouse gas emissions in 2030, 2050 and 2100 under nine fertility and migration scenarios. The Overpopulation Project urges everyone concerned about climate, the environment, and people to consider the multiplier effect of population growth, and the potential climate benefits of population stabilization or decline. In making climate policy, policymakers should acknowledge the role of population numbers. Policies aiming to increase national fertility and/or aiming for high immigration levels can hardly exist together with ambitious climate mitigation goals, as they work at cross-purposes. The most effective way to cut greenhouse gas emissions is to reduce per capita emissions in combination with a natural decline in the number of “capitas”. On this topic, see also our blog on the socioeconomic and environmental benefits of aging and smaller populations! Götmark, F., Cafaro, P. & O’Sullivan, J. Aging Human Populations: Good for Us, Good for the Earth. Trends Ecol. Evol. 33, 851–862 (2018). O’Neill, B. C. et al. Demographic change and carbon dioxide emissions. Lancet 380, 157–164 (2012). I’ve only skimmed it so far but it got prominent coverage on the BBC news today, which faithfully repeated its conclusion. The study’s come out of the U of Washington and claims to be original (although this refers to the methodology; it’s a mainly technical with a lot of data but the overall story is just a familiar one of transition). Of more concern is its conclusion – which the BBC stressed – that fertility decline will cause major social disruption and is therefore undesirable. It rehearses the usual reasons why women are having fewer children but flags up problems of population ageing…. I do think these sorts of article need an environmental rejoinder, especially given the very worrying climate change and biodiversity reports that came out last month. The BBC also covered these extensively but doesn’t seem capable of linking yesterday’s demographic argument with last week’s environmental evidence. Also frustrating that this piece received coverage, whereas suggestions that fertility decline is beneficial rarely get any airtime.